If, you’re going to start your business but don’t know how to make it stand out in the competitive market, then don’t worry. Today’s blog is written to educate you about digital marketing and how new revolutionary digital marketing trends can be beneficial for your business. 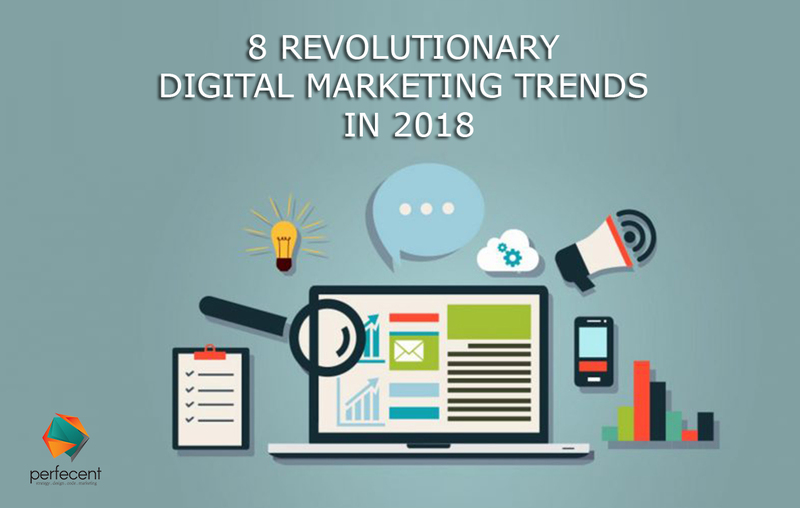 Before getting head towards the actual topic, ‘8 Revolutionary Digital Marketing Trends in 2018’. We must keep the clear definition of digital marketing in mind and know the importance of it in business. Digital marketing is online marketing that uses; email, websites, blogs, infographics, social media sites and all other online digital platforms for product’s marketing. Digital marketing is becoming a need with the increased use of the internet. Interestingly, more than 3 billion people are using the internet today. It is up to the marketer what strategy or tactic he’s using to promote his/her business via digital marketing. But he must know some of the important ongoing trends which help him in the business growth. Content that interacts with the people of today and tomorrow is becoming a need today. In fact, I’ve seen many doing this and turning out the potential customers to the permanent one. Evergreen content is like an evergreen tree that remains timeless, relevant, and interesting for people. It should comprise up-to-date facts and figures with the blend of timely information. Hire a team of freelancers for your 2018 business’ tasks. You can easily hire a freelancer from different places (like Fiverr and freelancer.com) and make your workflow easy. Be very careful, ask their pre-employment history, and other things for verification. One of the toughest tasks for the marketer is to manage social media posts. But now you can efficiently manage by scheduling each post. Try to schedule posts for the entire week with the interval of 20-30 minutes between each. Plan or schedule your posts with the scheduling tool. Postify, Buffer, and Postcron are some of the many post scheduling tools. One of the productive ways to make your business outclass this year is to have a critical approach towards your business. Cross check each and everything, see what your customers need, or if you’re fulfilling them. With 2.46 billion social users, social media is becoming an active tool for product marketing now. Use social media platforms wisely and see how it can benefit you most. It is free, provides you more sales, increases brand loyalty and most importantly helps you to respond problem quickly by interacting customers. Online reviews from the customers is another trendy way to promote business. By knowing what your customers are thinking about your product, you can improve your business overall. Allow your customers to talk about your brand, and share their reviews. You can also maintain a rating of five stars on your site. Another effective marketing strategy is email marketing. Just create a professional message about a company’s brand and send it to a group of people using email. It is one of the best marketing strategies as currently 3.7 billion people have email accounts and it is expected to grow by 4.1 billion in future. Today, in the world of marketing or SEO, Keywords are considered as the king. Choosing the smart keywords for product marketing is crucial for business growth. Adding 2-4 keywords on a blog or post help you in getting more traffic. So, these are some of the trends of 2018. Hopefully, now you know.